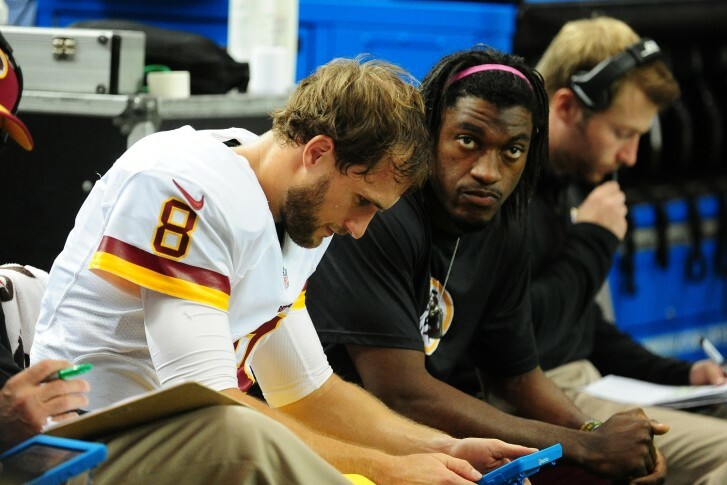 Where does RG3 go from here? Robert Griffin III's tenure in Washington seems all but over, but what does that mean for the quarterback's career? WASHINGTON — It all began so promisingly, with a franchise-altering trade, an electrifying rookie season, and Washington’s first playoff appearance in five years. But everything since that game, when Robert Griffin III’s knee buckled, twice, has changed, both for Griffin and his team. It’s hard to imagine a path worse for Griffin the past three years. He was reinjured after rushing back quicker than his body was ready for. His numbers tumbled as his interception rate doubled his second season. All the goodwill built up from 2012 was undone by failing to meet his own lofty expectations, coupled with his inability to say what fans wanted to hear as he struggled. Under Jay Gruden’s watch, rumors flew that ownership preferred Griffin while Gruden wanted Kirk Cousins instead. In the meantime, Griffin continued to struggle in 2014, his playing style and his lack of protection combining to lead to more sacks (33) in just seven starts than any NFL quarterback this century. By the time the final preseason game had been played this year, he had his starting job swiped out from underneath him. Cousins stepped in and, after some early struggles, put together by far his best stretch as a pro as the season went on, helping Washington take advantage of a lightweight division and a schedule with only three winning teams to the tune of an NFC East title, a home playoff game, and a new rallying cry. Any goodwill reserved for Griffin was gone by the time Jordan Reed hauled in Cousins’ touchdown pass in the second quarter against the Packers, giving Washington its biggest lead of the game. Even with the playoff loss, Cousins seems the obvious choice moving forward. But where does that leave Griffin? To say that he has done nothing this year would be a lazy fallacy. Griffin played the part of Bills quarterback Tyrod Taylor on the practice squad heading into a must-win Week 15 game. That means he was playing in the more familiar, more natural read-option system. Something must have worked — Washington beat Buffalo by 10, the only team they defeated all season that didn’t have a losing record. Cousins got the credit, of course, with 319 yards and four touchdowns. Perhaps more importantly, Griffin stayed out of the spotlight after the preseason, graciously and selflessly doing as he was told to do. With it obvious to everyone that he has no future in Washington, his somewhat over-the-top goodbye letter left in his locker Monday seemed a public acknowledgment of that fact, that the team has no choice but to trade him or cut him before the March deadline. So where should he go? The recent clamor in the press has linked Griffin potentially to Dallas. But that doesn’t make a whole lot of sense in terms of either the existing personnel or the Cowboys’ scheme. With Tony Romo entrenched as the starter in a pro-style offense, it’s hard to imagine where Griffin would be anything other than a backup, while still toiling in an offense that fails to use his skills. But there’s another team in Texas with a good defensive foundation in place in need of an offensive overhaul. The Houston Texans made the playoffs despite a rotating door of disaster behind center and star running back Arian Foster’s season-ending injury in training camp. With Foster back, supported by the emerging Alfred Blue, the Texans have a solid running game to go along with the DeAndre Hopkins and the vertical receiving game to stretch the field and make life miserable for its opponents. From Houston’s standpoint, acquiring Griffin might keep the club from drafting the highly questionable Christian Hackenberg, who head coach Bill O’Brien coached at Penn State but who has fallen woefully short of expectations as a pro prospect this season. Griffin, meanwhile, should be as healthy as he’s been since that 2012 injury, being spared contact since the preseason. Houston is nearly as close to his Copperas Cove, Texas home as Dallas is, and a fresh start back in a place where he remains a folk hero might be ideal for Griffin’s psyche. And for those fans who claim they don’t care about Griffin anymore, at least it keeps him away from the most hated division rival, where a career renaissance could conceivably be directly damaging to Washington’s hopes of returning to the postseason. Regardless of where he goes and how his career progresses, Griffin’s legacy in Washington will always be bittersweet. His peak came so quickly and inspired such a frenzied optimism in the fan base that it’s almost hard to believe his current predicament. And while he’s certainly done in D.C., there’s no reason to believe, still at just 25, he couldn’t still find success elsewhere.